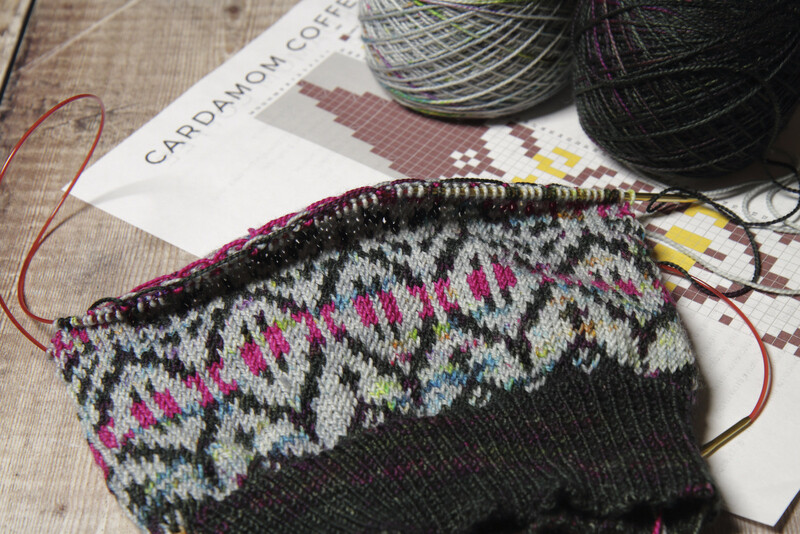 If you’re both an avid colourwork knitter and a lover of hand-dyed yarn then the chances are you’re already a fan of designer Caitlin Hunter of Boyland Knitworks. Indeed, you may already have a few projects under your belt. Although I’ve been a follower for a while and have been itching to knit one of her designs, for the simple reason of there not being enough hours in the day for everything I want to do, this is my first. The pattern is the wonderful Cardamom Coffee hat, the yarn is It’s a Stitch Up Favourite Sock, our pure merino 4 ply, in Dark Winter (dark), Ore (speckled grey) and La Vie En Rose (pink, of course). Aside: ‘Dark Winter’ is a shade we dyed as a one-off for our Yarn Club and 12 Days of Pom-mas box is sold out. Lots of folks have asked if we’ll do more and I think we will, but we have quite a backlog at the moment. In the mean time, ‘Space Race‘ would be an excellent substitute. When it comes to creative pursuits, I really dislike rules, and Hunter demonstrates that precepts like “you can’t use hand-dyed yarn for colourwork” should be taken with a pinch of salt (if not ignored completely). Indeed, her popular Sunset Highway and brand new Sturgill sweater designs are colourwork canvasses for even the most variegated yarns. How does she pull it off? 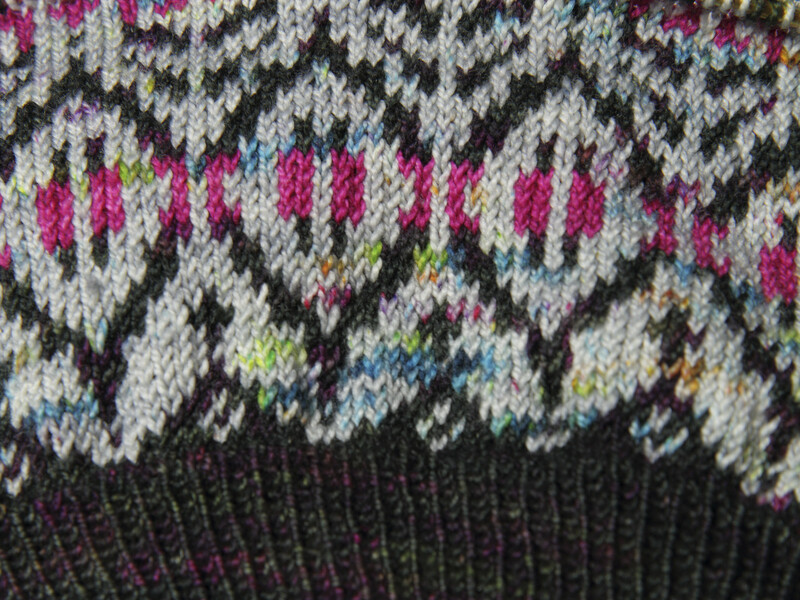 The secret is her use of big, bold motifs in two or three colours that let the yarn do the talking, rather than the delicate, intricate repeating patterns in multitudes of colours of stranded Shetland and classic Fair Isle. 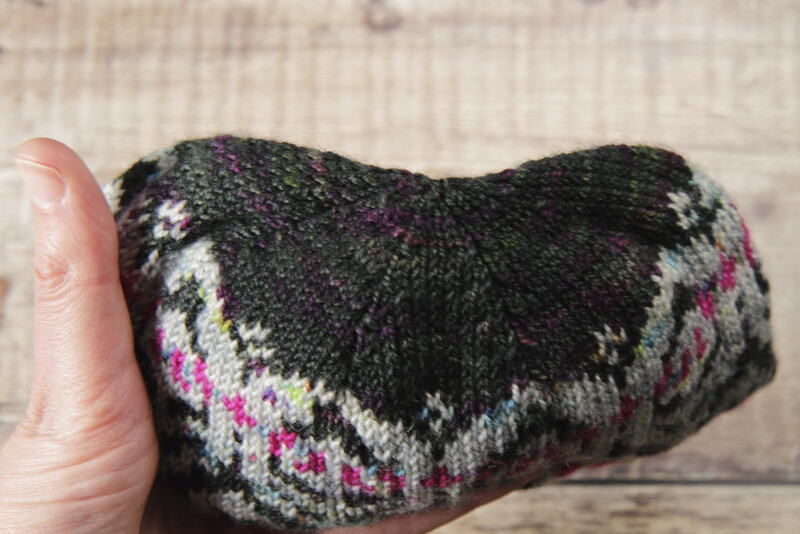 With large stranded motifs come long floats: nine stitches long in this design, which I found manageable but might make some knitters uncomfortable, especially as Hunter recommends not catching floats. 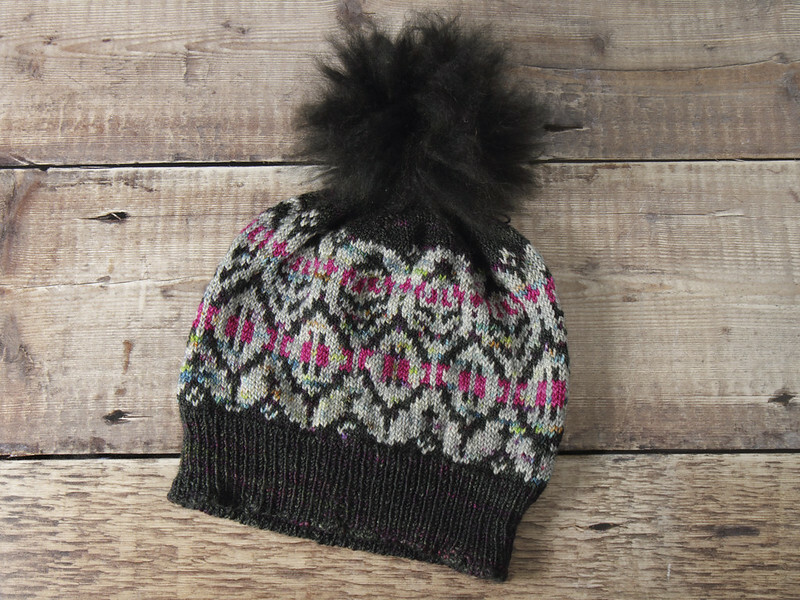 I would probably not knit this kind of design for my young daughter, who likes nothing more than pulling out float strands from her hat and using them to swing it around on her fingers (and those were only five stitches long!). What I like about this design: It’s gorgeous, just beautiful. Every row was enjoyable to work because the way the colours unfurled was always different. What I didn’t like: There was one really big disappointment in that it’s a tiny bit too small for me. The hat comes in three sizes: Child, Adult S-M and Adult L. I am an adult with a smallish head so I picked the middle size. The finished, unstretched hat circumferences are given, but head sizes are not given, and with hindsight the garment circumference was not that useful to me because stranded work stretches less than regular knitting. I have worn it once and while it wasn’t uncomfortable at all, I found myself having to pull it back onto my head. I’m sure I’ll have no trouble finding a suitable home for the hat and its new owner will love it, and I probably will make another for myself in the larger size. The second thing that bothers me about the project is that the crown gathers in an awkward, bunchy way. Essentially, the curve on the fold line indicates that the second half of the crown decreases happen too quickly. If I were to knit this again I would throw in three or four extra non-decrease rows between row 49 and the end to help it sit flat. But, the thing about hats where the sizing is defined by the number of horizontal repeats is that the ratio of those crown decreases ends of different for every size, so I would need to make a different adjustment for the large size. 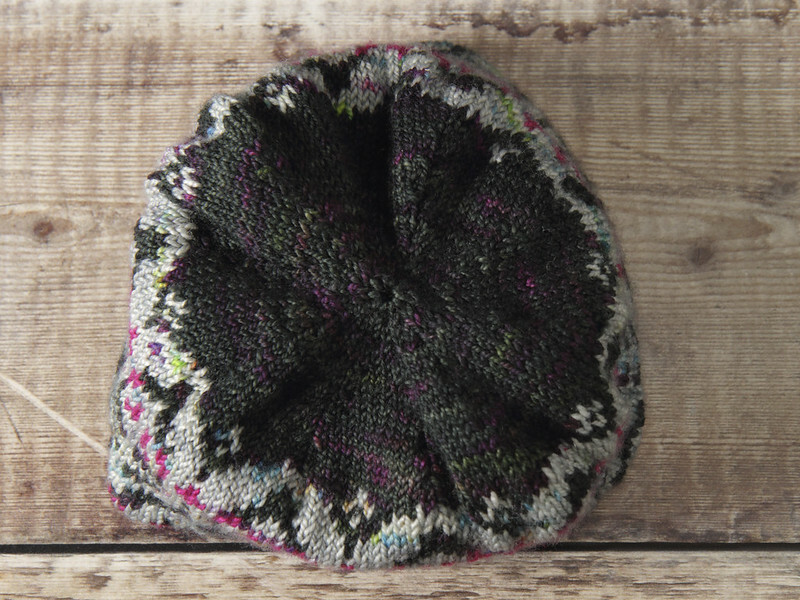 The quick solution is to stick on a large pompom and hide the problem, which works for me!